We recommend campers pack for camp using a traditional footlocker (trunk) and a duffel bag. The duffel is ideal for transporting bedding and other soft items, and the footlocker can serve as a “dresser” while at camp. Limit luggage pieces to one standard size footlocker and one duffel bag. For additional miscellaneous items, a small backpack or other “hand luggage” piece is recommended. Label every piece of luggage and any additional separate item with your camper’s first and last name. Try to avoid loose tags when labeling. When shipping, make sure baggage will close completely and latch securely (locked if possible). Footlockers and other baggage may be shipped to camp via Fedex, UPS or DHL. We ask that you arrange for your baggage to arrive within one week of your session’s opening day. Please do not send it sooner. 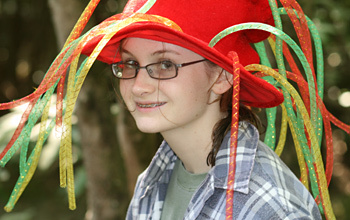 If your camper is flying, we strongly advise shipping her baggage to camp. Heightened security at our local airport, and recent changes in airline fees, have made transporting camp baggage by plane difficult. 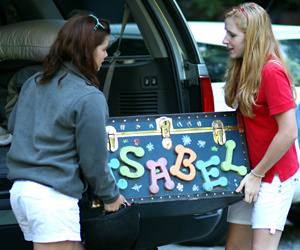 If you would like your daughter’s trunk shipped home from camp, please let us know on the travel form and by completing the “Luggage Shipping” form available in your Campminder online account. This form requests shipping details, indicates further camp policies and explains shipping fees.